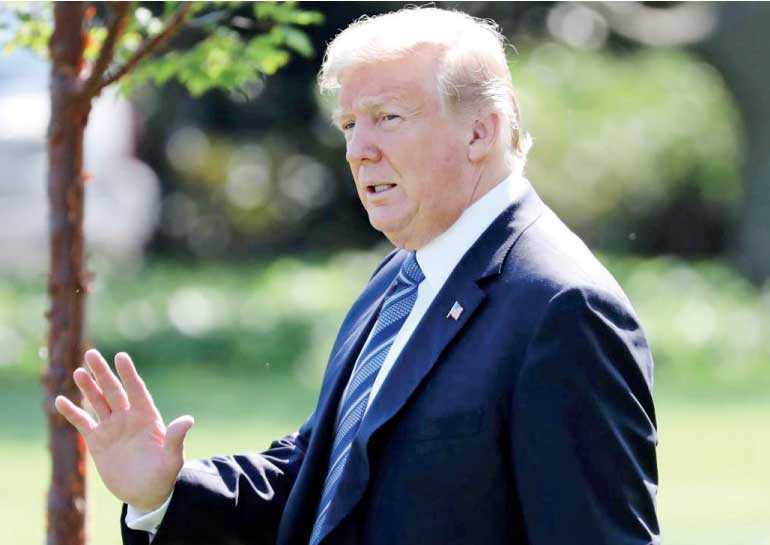 Aboard Air Force One/Washington (Reuters): US President Donald Trump warned on Friday he was ready to slap tariffs on virtually all Chinese imports into the United States, threatening duties on another $267 billion of goods on top of $200 billion in imports primed for levies in coming days. The moves would sharply escalate Trump’s trade war with Beijing over his demands for major changes in economic, trade and technology policy. China has threatened retaliation, which could include action against US companies operating there. Stock prices slipped after his comments, with the S&P 500 off 0.2%, while China’s off-shore trade yuan currency fell against the dollar. The $200 billion list, which includes some consumer products such as cameras and recording devices, luggage, handbags, tires and vacuum cleaners, would be subject to tariffs of 10% to 25%.Cell phones, the biggest US import from China, have so far been spared, but would be engulfed if Trump activates the $267 billion tariff list. Trump’s threatened tariffs, now totalling $517 billion in Chinese goods, would exceed the $505 billion in goods imported from China last year. But 2018 imports from China through July were up nearly 9% over the same period of 2017, according to US Census Bureau data. Major technology company Apple Inc. said a “wide range” of its products would be hit by the tariffs, but not its iPhone. It said in a late submission that its AirPods headphones, some of Apple’s Beats headphones, and its new HomePod smart speaker would face levies, causing its shares to slip in late trading. Retailers had successfully kept high-profile consumer electronics such as cell phones and television sets off of previous tariff lists. But David French, top lobbyist for the National Retail Federation, whose members include Amazon.com, BJ’s Wholesale Club and Macy’s, said nearly every consumer good could be affected if Trump follows through on all threatened tariffs. Beijing (Reuters); China’s trade surplus with the United States widened to a record in August even as the country’s export growth slowed slightly, an outcome that could push President Donald Trump to turn up the heat on Beijing in their cantankerous trade dispute. Over the first eight months of the year, China’s surplus with its largest export market has risen nearly 15%, adding to tensions in the trade relationship between the world’s two largest economies. China’s annual export growth in August moderated slightly to 9.8%, the data showed, the weakest rate since March but only slightly below recent trends. The number missed analysts’ forecasts that shipments from the world’s largest exporter would rise 10.1%, slowing only slightly from 12.2% in July. Even with US tariffs targeting $50 billion of Chinese exports in effect for their first full month in August, China’s exports to the United States still accelerated, growing 13.2% from a year earlier from 11.2% in July. China’s imports from the United States grew only 2.7% in August, a slowdown from 11.1% in July. Washington has long criticised China’s huge trade surplus with the United States and has demanded Beijing reduce it. Still, disagreements between the two major economic powers run deeper than just the trade balance and tensions remain over limits on US firms’ access to Chinese markets, intellectual property protection, technology transfers and investment. Imports, a key gauge of the strength of China’s domestic demand, grew 20%, beating forecasts. Analysts had expected growth of 18.7%, slowing from July’s surprisingly high 27.3%. Economists have noted that disruptions in supply chains are likely to be more company specific, and will take time to be reflected in broad economic data and corporate earnings reports. However, anecdotal evidence of mounting trade damage on both sides of the Pacific is on the rise. “Risks have increased due to the negative impacts of China-US trade friction. The impact on exports may gradually start to show up, with future export growth possible declining,” said Liu Xuezhi, an analyst with Bank of Communications.